A year ago I spent a lot of time at Holden Village and Stehekin in Northeastern Washington State. Below I've linked those adventures. Reading them before jumping into this story is recommended. 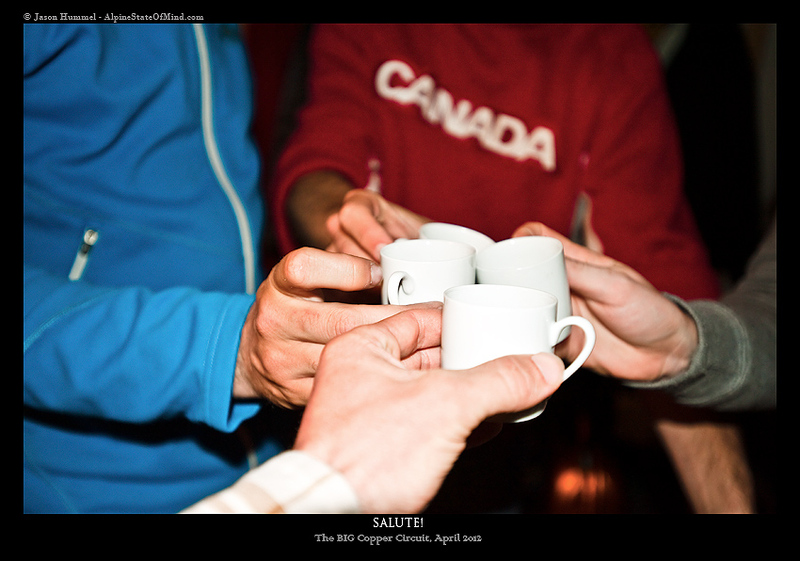 On April 11th, 2012 we had come full circle, back to the shores of Lake Chelan. Kyle Miller was again carrying his gear down the gangway to the 'Lady of the Lake' that would ferry us to Lucerne where we'd meet a bus to take us to Holden Village. It was from which point we'd go and ski lofty peaks. 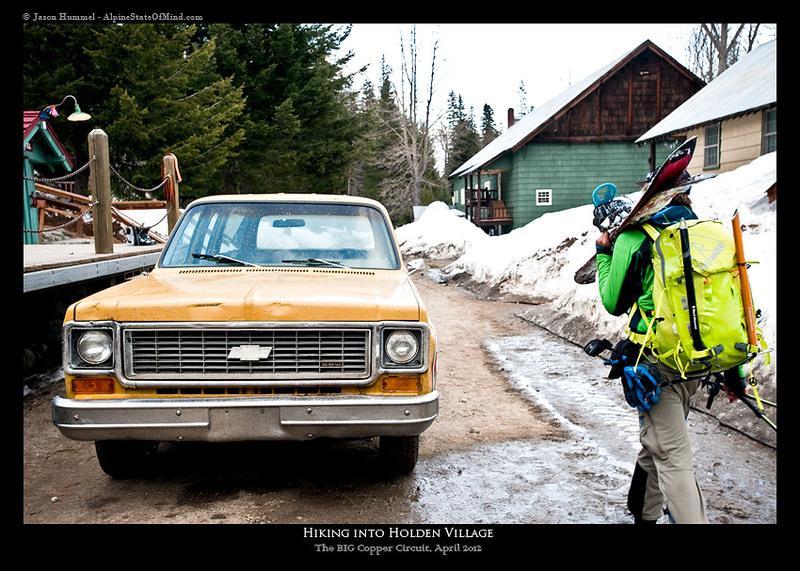 Hours later we were stepping off the bus into Holden Village to an awaiting crowd. On the steps of the main building were a cadre of town volunteers waving banners and hands in greeting. This is a town tradition for any arrivals be they new or old. Among that crowd we spotted faces we remembered. One in particular stood out. 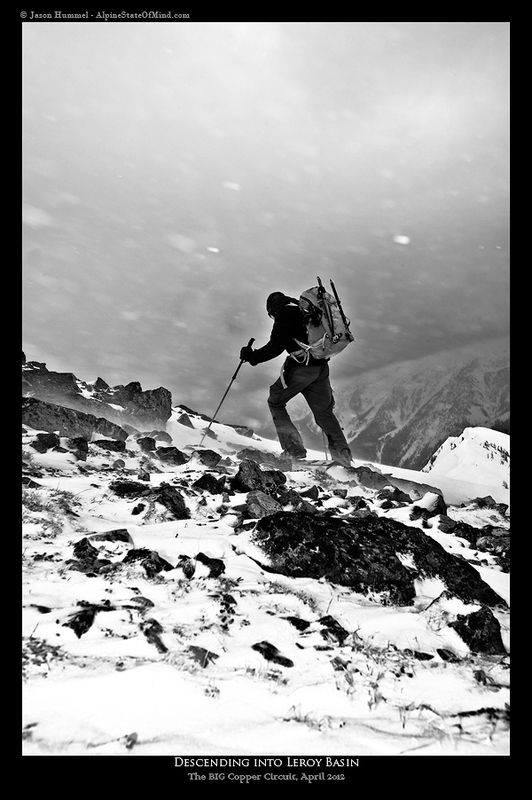 The previous year we had taken a town local along on our climb and ski of the steep NE Face of Bonanza Peak, purely on a whim, and with no knowledge as to his skills or conditioning. Brennan didn't let us down. That is why, even as we stepped out of the bus, there wasn't a second thought in inviting him on our upcoming adventure. It was an invitation to which he couldn't say no. While waiting for the weather and avalanche conditions to improve, Kyle and I stratagized. We wanted to come up with an adventure that would take full advantage of a predicted three day weather window. 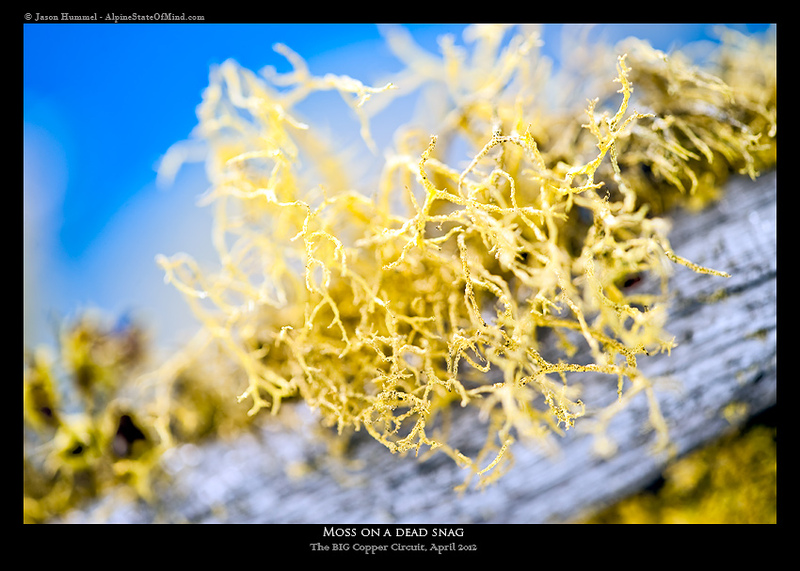 Since Mount Maude and Seven Fingered Jack were our main goals, we decided to link them together by ascending Copper Creek and descending Big Creek. The potential was there for being a classic tour. 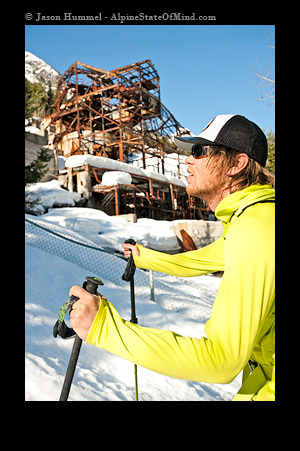 That quest to find out what our plan's potential was began early Friday morning with Brennan, Kyle and I skiing past the Holden mine. From our skin track the rusted metal bones of the main mine structure appeared ready to crumble at any moment. Leaving it behind for the forest was easy. Following an old road beyond the mine would lead us into Copper Creek Valley. By lunch, four thousand feet up Copper Creek, we arrived at a leftward pass. In hindsight the rightmost pass would've turned out to be the better option. 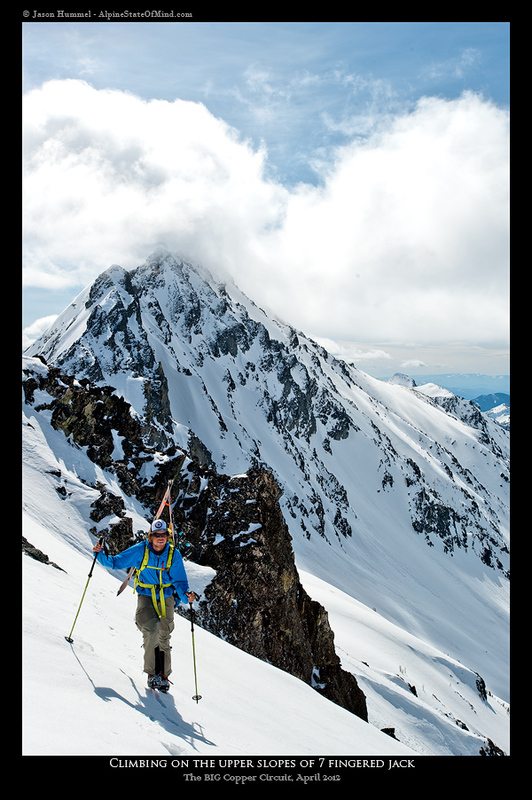 Either way you choose, we found the ski to the base of the north face of Mount Maude through cliffs to be very manageable. Before ascending again, we took a break at the base of the peaks. In those moments spent resting between Maude and Fernow, I became intoxicated with the view. Everywhere around us, the alpine spirits being brewed have been aged to perfection. Like a curse, our heads were spinning in every direction. Best of all was knowing that our skis would soon be dancing down these slopes. Our ascent from the valley bottom to Ice Lakes was to take us beneath the Entiat Icefall. 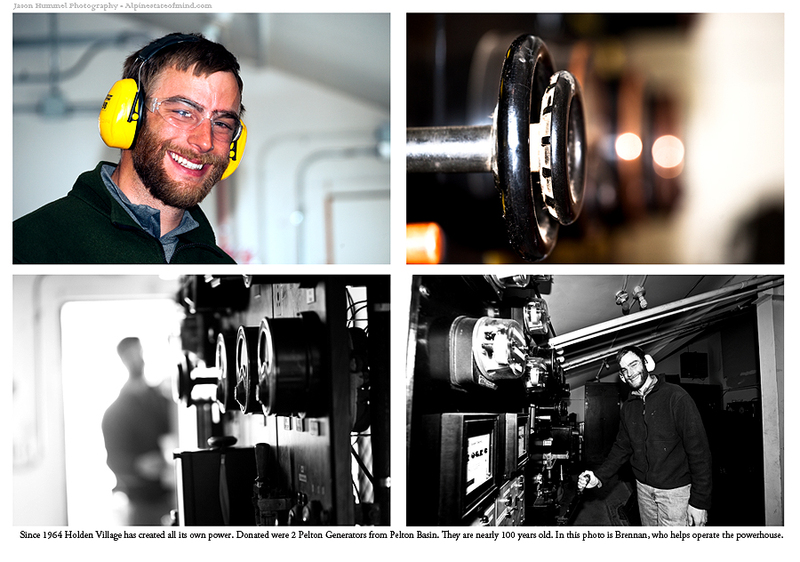 While small, it was certainly big enough to send chunks of ice down onto us without so much as a second thought. In an attempt to alleviate the risk on this very warm day, I skinned beneath cliffs and moved very quickly through the open areas. Once out of harms way, I felt better. Motioning for Kyle take the lead, I called out with my standard excuse, "Hey Kyle, will you climb ahead, I need to get a photo." Like cattle to the slaughterhouse, he falls for it every time. Although Kyle had taken the lead, breaking trail didn't slow him down any. He roasted up the skin track! I trailed behind with Brennan and only paused when I reached the sun-shadow line. 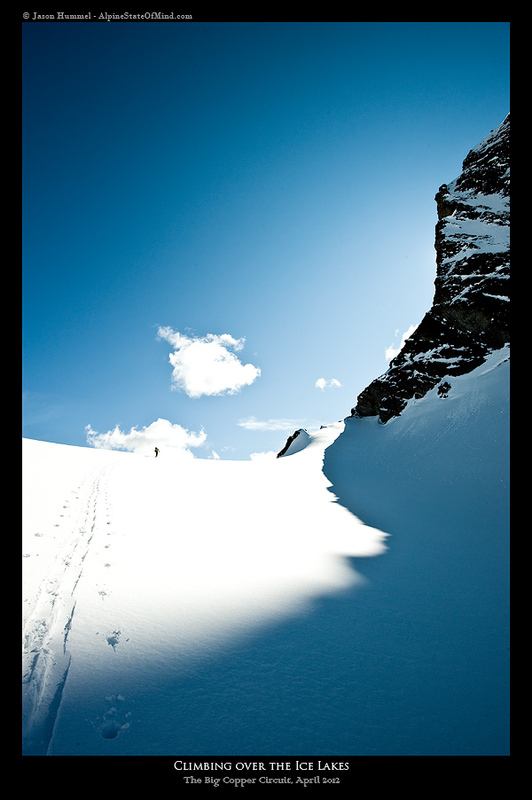 In a mountain environment that is often marked by expressionless snowscapes, this border between light and dark adds color and tone, shape and form. Getting down on my knees for a photograph, I got a closer view of this non-corporeal entity. It reminded me of the ocean. If you could fast forward time, these shadows would ebb and flow on a tide, a solar tide. Views of Spectacle Buttes framed the appropriately named (and very frozen) Ice Lakes as we crested our final pass for the day. In an hour we'd have our camp dug out and tents pitched on a small knob near the lakeshore. We'd spend a restful night under brilliant night skies. Sightings of warm sunrays were spotted to the east. Coupled with that sun were our hopes for another spectacular day. No matter our expectations, the combined forces of gray appeared to be dominating the sky. It was another point against the weathermen. Their arcane arts be damned. Instead, our own two eyes are what can be depended on for foreseeing the weather. Those blue holes they could make out in the distance were a promising sign, but far from being definitive. Nevertheless, what improvement we saw was enough evidence to convince us to tidy up camp, finish breakfast and head for the summit of Mount Maude. 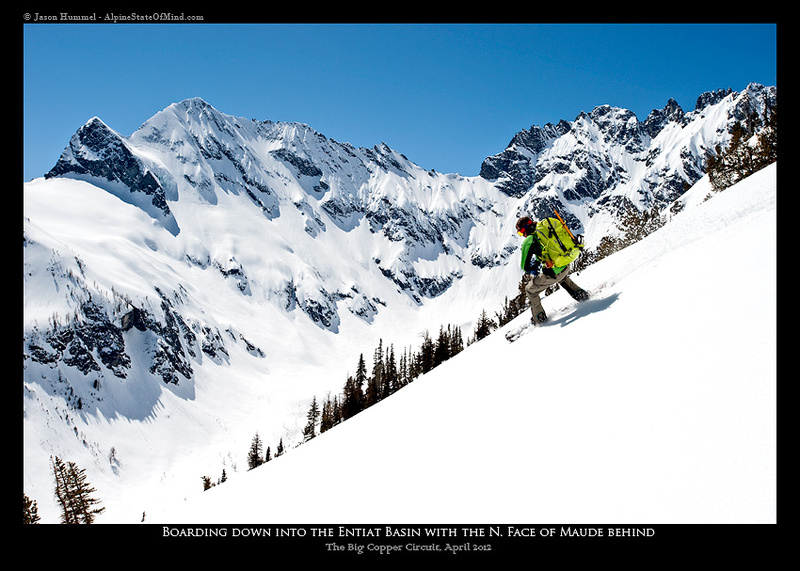 There are several skiable routes on Mount Maude. 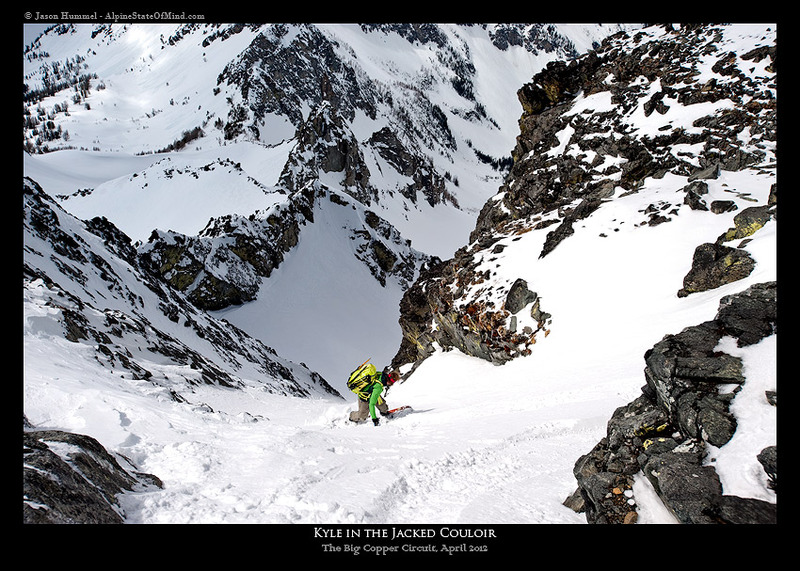 Of the six that have been skied, the north face stands out. 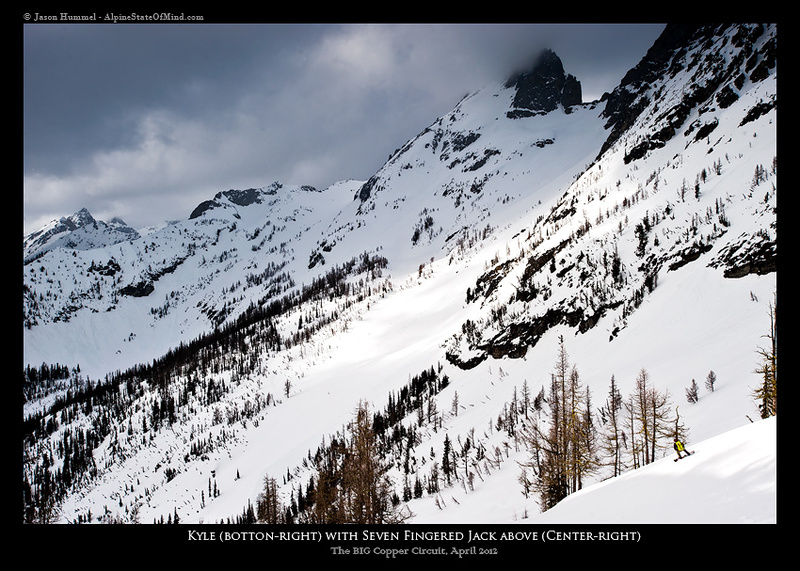 Fred Becky published an image of this route on the inside cover of his Cascade Alpine Guide. 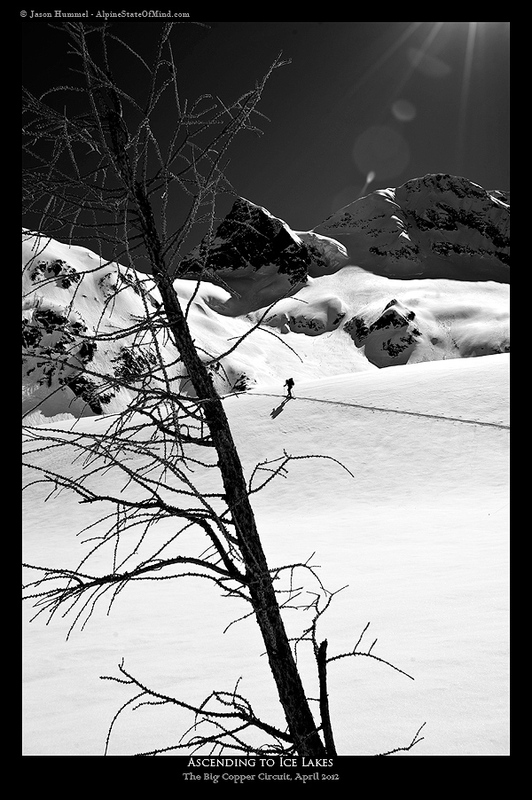 Little did he know that when he put it there, it would not only tempt climbers, but ski mountaineers. What appeals to us is the two or three thousand feet of steep, sustained slopes that average around forty-five degrees. Our plan was to ascend the south shoulder and descend the north face. It would be my fourth time on the mountain and my third time on this route. During the climb across Ice Lakes, I thought about how truly alien flat places are. Like straight lines, neither are common outside of manmade objects. It made our skin track and final boot pack to the south shoulder look that much more unnatural. Perfectly commonplace was the mountain goat that we saw appear just above us on the ridge. As he stood on a rock outcrop, he looked at us and we looked at him. In an instant he disappeared behind the ridge and we wouldn't see him again. I expect we only saw him in the first place because he let us. At the summit Kyle and I bid Brennan farewell. He was going to descend the way we had come while we'd attempt the North Face. Even before we arrived above the route, I was apprehensive. 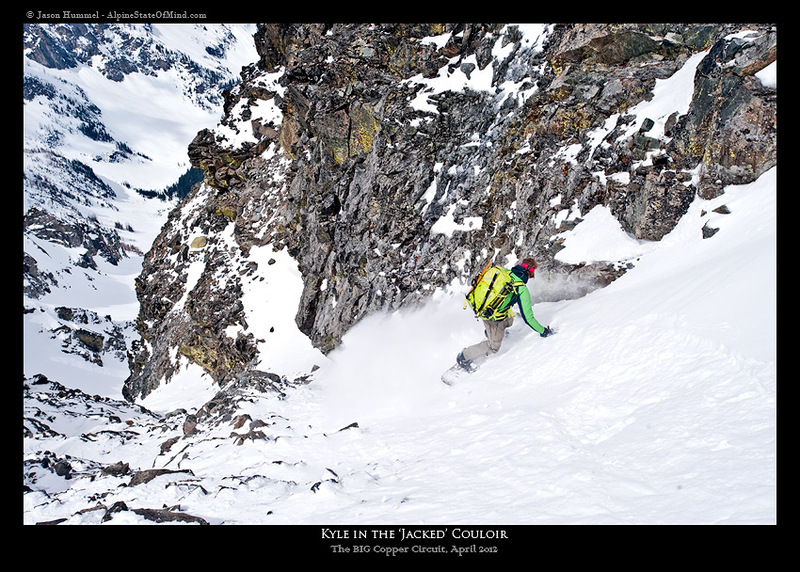 The last time I was on this face a huge cornice had released and swept the entire thing, missing our group by seconds. Seeing a rather large cornice on top of the route reawakened those memories of car-sized chunks of ice and the accompanying wet-slide taking out the entire route just feet from where I was standing, midway down the face on a ledge system leading back to the Jack/Maude col. But more on my mind then was the fog and clouds. Skiing a route in such conditions are like skiing with a blindfold on. After Kyle slipped himself and his board onto the north face, I took a deep breath, put my concerns away and swam my skis through the fog and dropped in. 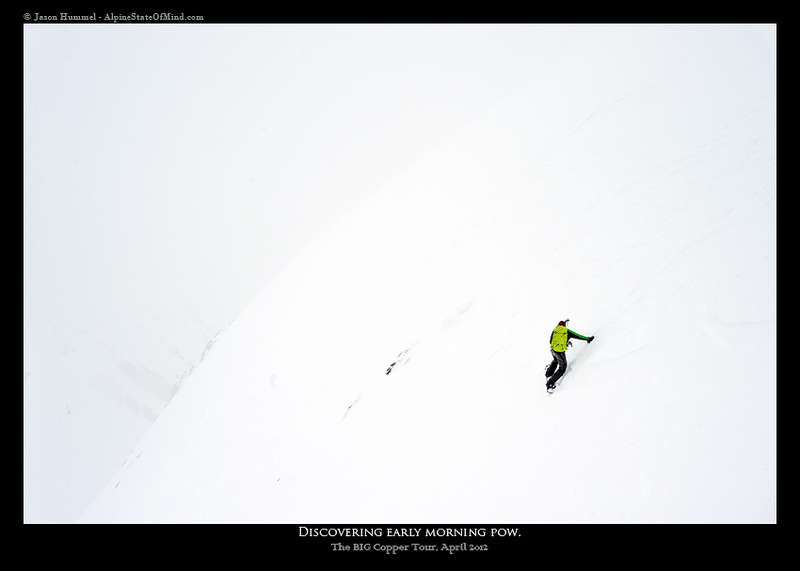 The route was a mix of wind-buffed powder and hard slab. Overall we were able to stay on fairly great snow throughout, especially when we dropped into a few narrow sections. It was at one these places that I waited for Kyle. The view up from that spot was a great one. Studding the route were rocky ramparts that were broken by slivers of white snow. At that point I got that feeling of "Wow, I skied that!" As it is in photography, compression of the scene can confuse your perception of reality. This is an honest-to-goodness classic route no doubt, but it isn't so crazy either. 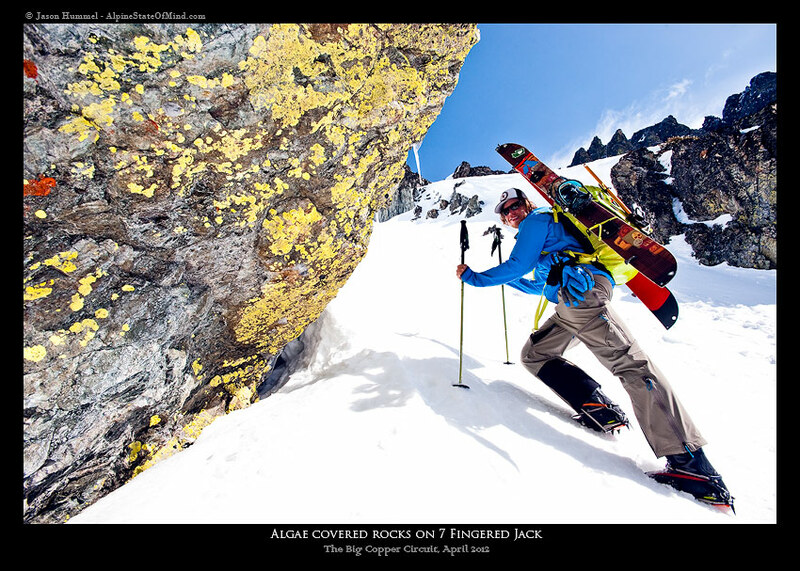 While racing back up beneath the Entiat Icefall, my mind turned to our next peak, Seven Fingered Jack. Once our skins were on we blazed our way back to camp where we rejoined Brennan. He came out of the tent and told us about his amazing nap while we were gone. Kyle and I were tempted to do the same, but instead we ate, melted water and broke down camp. That night we settled into another camp below the west face of Mount Maude, high up in Leroy Basin. All night a stiff breeze kept us company. By morning we hoped for better weather. Little did we know about the excitement that lay ahead. I find that in adventure, it comes when you least expect it. There's no preparing for it. So even if we expected an easy day, sometimes your eyes are bigger than your mouth is. That was the case for us. 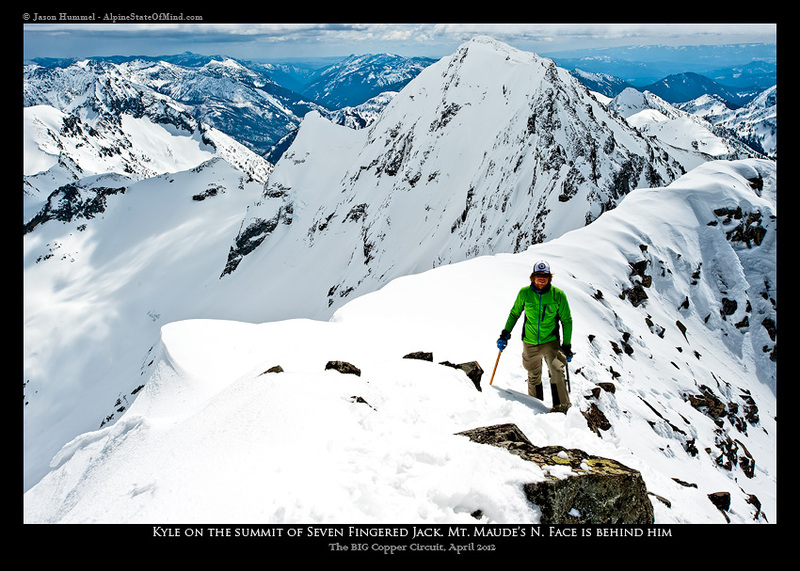 Taking an easy couloir that granted access to the summit, we ascended to a gentle ridge. Between rocks and snow patches we reached the top in a short time. 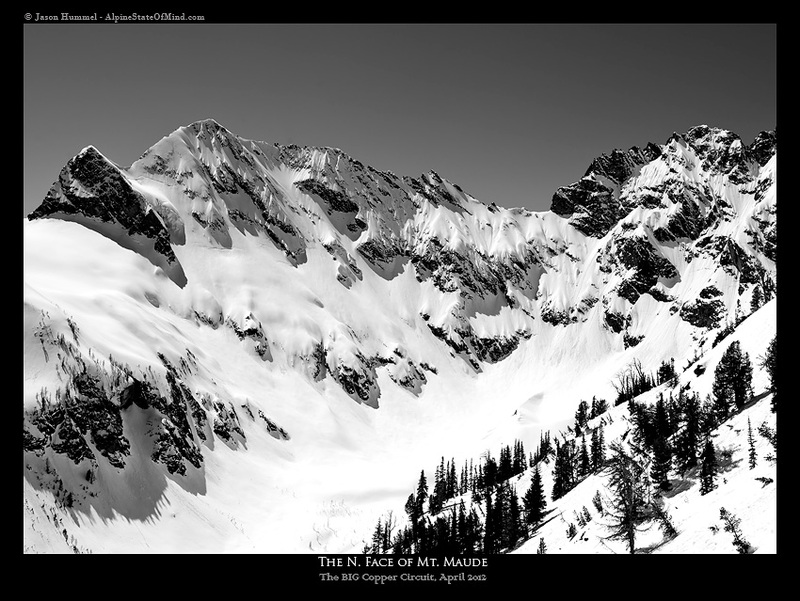 Along the way, even at this years maximum snow pack, the final slopes hold little to no snow at all. 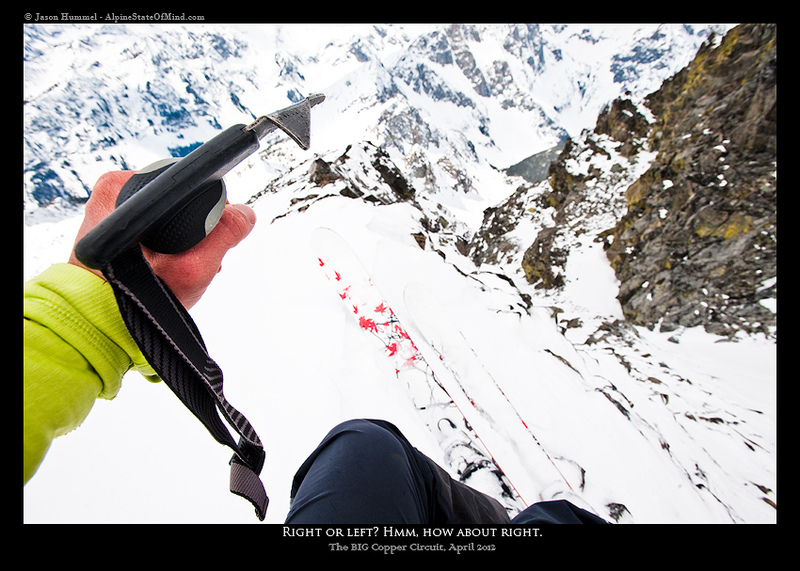 While the idea of skiing from the highest point was appealing to me, I didn't think it would be practical until I had come to the top and looked back down. 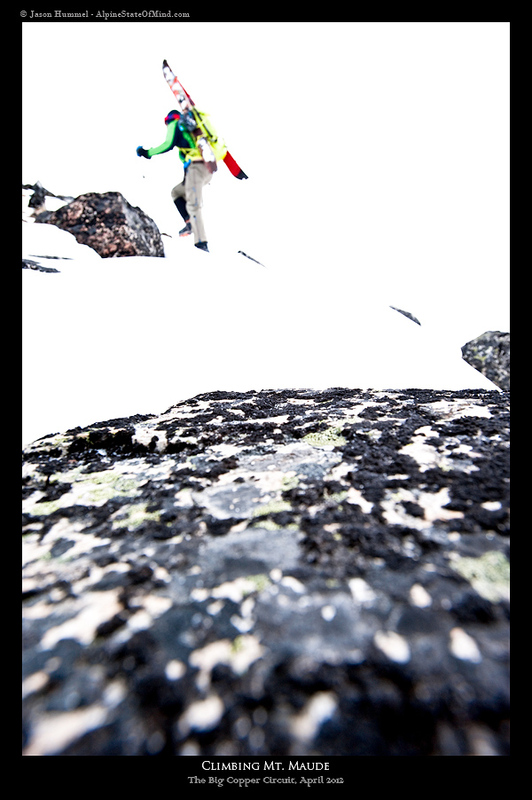 Once I arrived and took full measure of the ski, it still wasn't practical, but it was possible with copious amounts of sidestepping and finagling through rocks. That was enough of an opening to convince me to go for it - just as soon as Kyle and Brennan down climbed the top 100-ft and were safely out of the way that is. 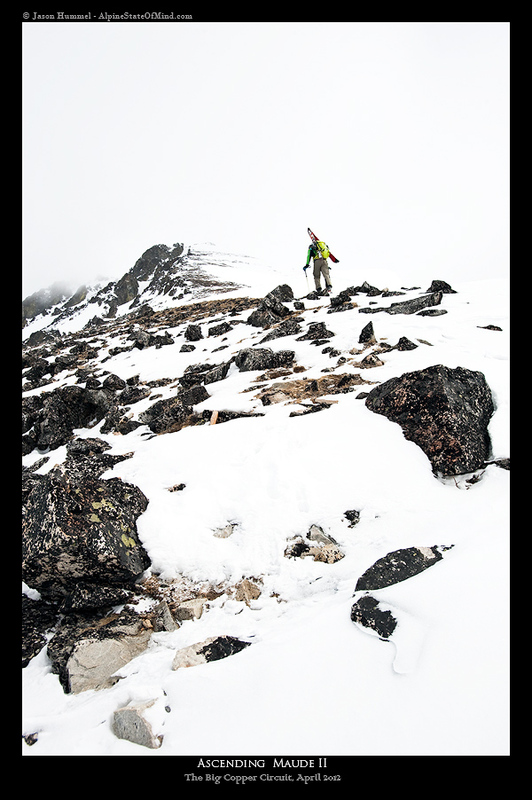 Once they were around the corner, I proceeded with a few sketchy turns on hard snow, followed by rock hoping and a final traverse over cliffs back to the bigger snowfields on the gentle ridge. Just a few hundred feet below the ridge I sat next to a couloir we had earlier investigated, but for no intensive purposes intended on skiing. 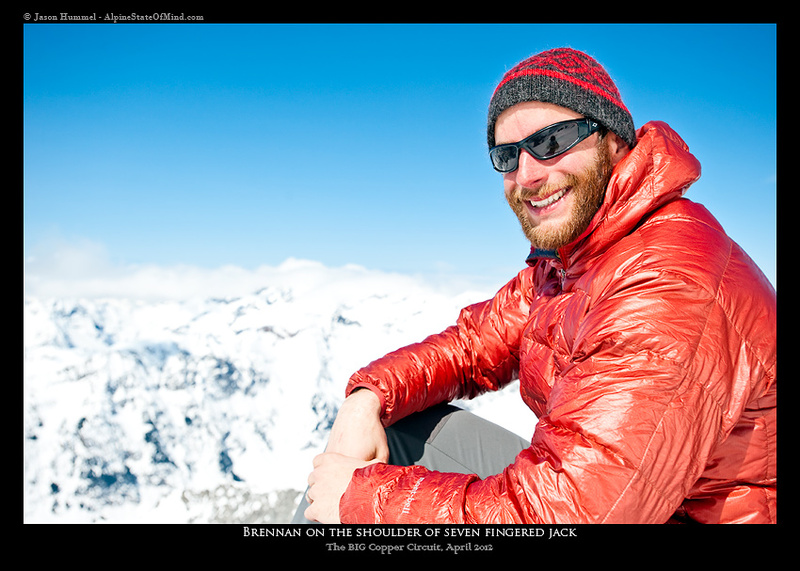 At least that was until Brennan down climbed to a point overlooking the entire couloir. Glancing over the edge he called up and said, "I think it goes!" To which I responded, "Are you sure?" As Kyle arrived, he shouted at Brennan to reconfirm, "Are you sure it goes?" He shouted back again in affirmation. As it turns out, Brennan had thought that this was our only option to get onto the Gloomy Glacier. Not quite, but I'm always up for a taste of adventure. First turns into the couloir took us through a rock choke. 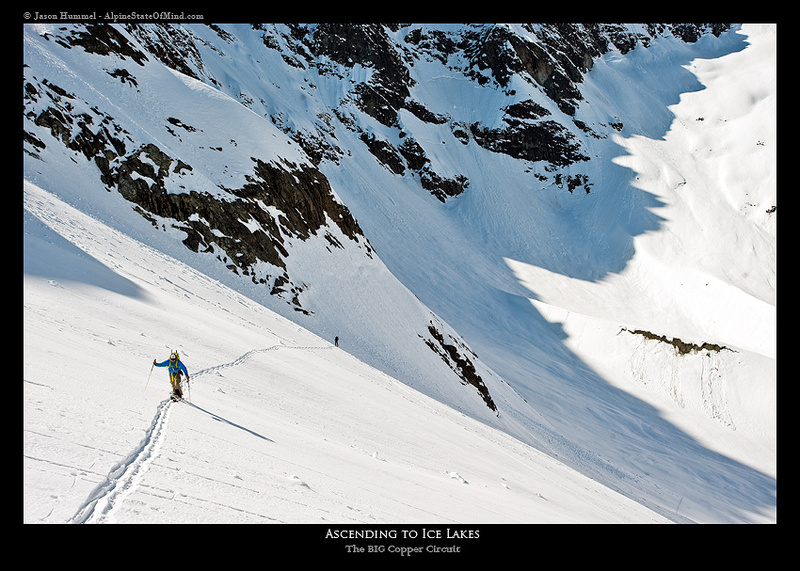 From there the couloir rolls over and appears as if it's next stop is the Gloomy Glacier. All along I'm thinking, "Man, if this goes, it's going to be a rad route!" 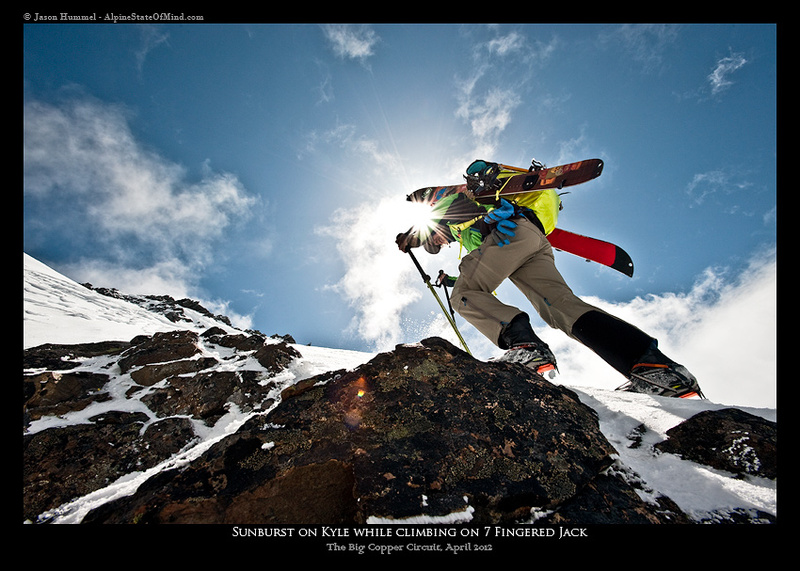 Because of the uncertainty I laughed and pre-christened the line the "Jacked Couloir". Better for us would've been to name it more favorably because it was about to live up to that namesake. If there was wood around, I should've been knocking on it vigorously. After proceeding through a narrow section, Kyle and I had Brennan, who was down climbing, take a look beyond another narrow constriction, so we could find out if it was possible. When he yelled up that it was fine, Kyle and I joined him. On the steepest section I noticed a rain crust under my skis. It made for a tenuous few moments. Kyle took the lead after he pulled out his axe. Eventually I went to the front and even managed a few careful turns. 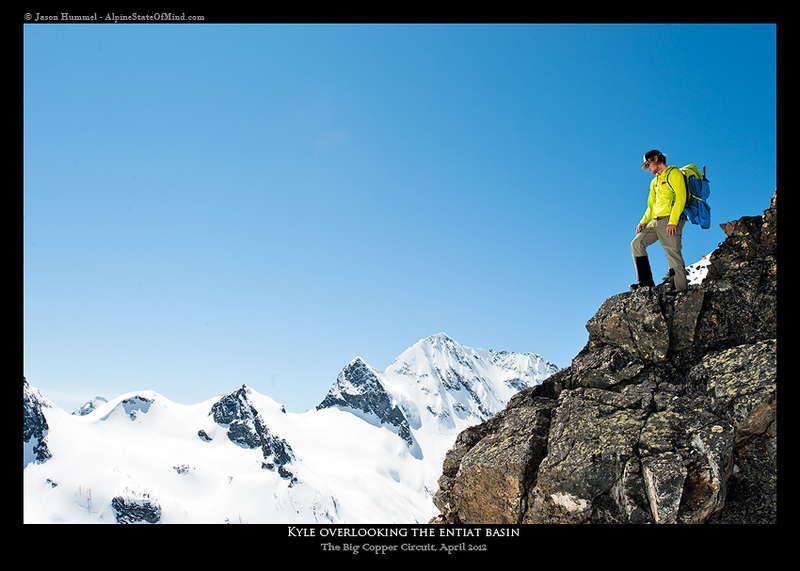 It was then, a few hundred feet above the glacier that I noticed a cliff at the very bottom. 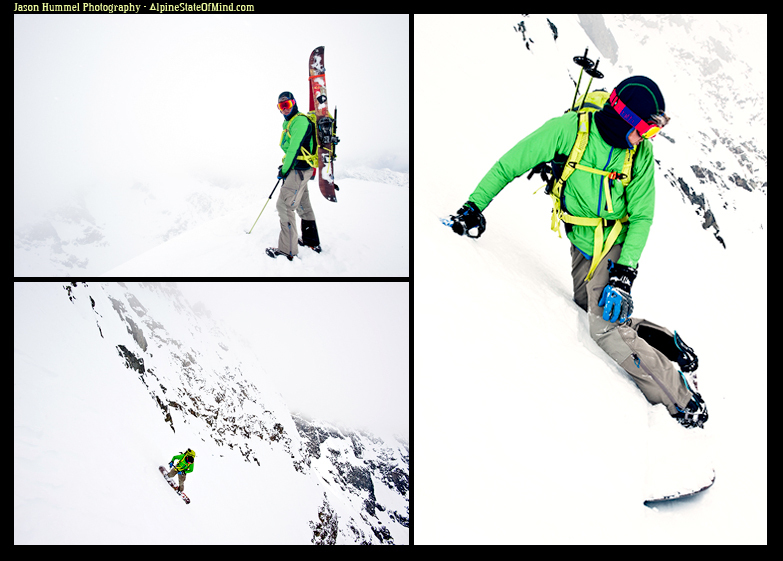 With no escape out the bottom of the couloir and no rope or pro, we had no option but to transition from skis and descending to crampons and ascending. It is never fun to transition. 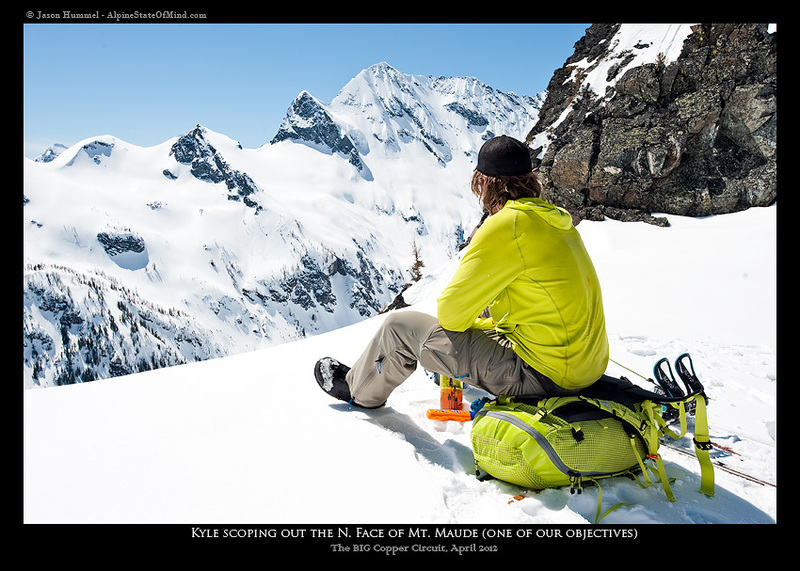 The juggling act of poles, skis, pack, crampons and axe make for stressful moments. That never changes no matter how many times I have done this. Nevertheless, once all the gear was situated, the climb back up was enjoyable especially with Brennan's brilliant boot pack. 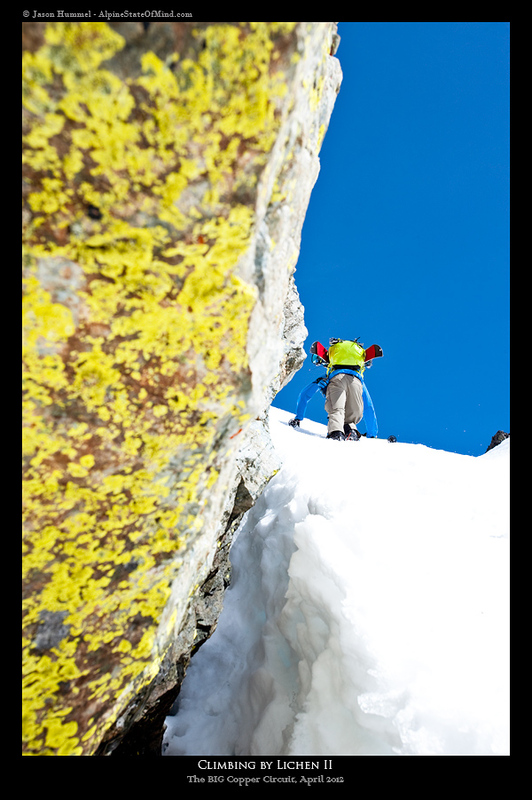 It bypassed the main couloir and led us up a side chute. This cut our ascent in half. Nearly at the top of the Seven Fingered Jack, we changed to ski mode again. At that point we were cold and tired. It was also getting late in the day. Making matters worse was our uncertainty about accessing the Gloomy Glacier easily. We discovered that this wasn't a concern as soon as we traversed across a snowfield directly to the top of a narrow chute. This was directly below the 'Jacked Couloir'. Skiing from that point on rewarded us with thousands of feet of spectacular skiing. It was an unlikely reward. Adding further to our enjoyment was the amphitheater of rock and ice. From the moraine, I stood planted in the snow unwilling to leave this place, even as the others had skied out of sight. There are few valleys I've seen in the Cascades that have impressed me as much as this one. From this point to Holden Village was 5-6 miles of undulating terrain along Big Creek. While Kyle was forced to split his board and skin/ski his way out, Brennan and I enjoyed scooting across easy flats and short down hills. Along the way, views to the right reminded me of the previous years descent of the north face of Fernow, but it wasn't those memories that squandered my attention, but instead it was the bear tracks at my feet that kept me most entranced. You may be asking why that is the case? It is because I love when nature tells me a story. Going straight and determined were big bear tracks and full of boundless, uncontrolled energy and excitement where little bear tracks dancing all around the much larger ones. In that moment, I was reminded of a reality that is as true among bears as it is among humans. There's a change that occurs from adolescence to maturity. We become more serious. "I'm getting older too," like Stevie Nicks sings in her song landslide which she ends in, "Will the landslide bring you down?" Whether the landslide will bring any of us down or not is up to us. Perhaps we all just need to find the kid in ourselves again? 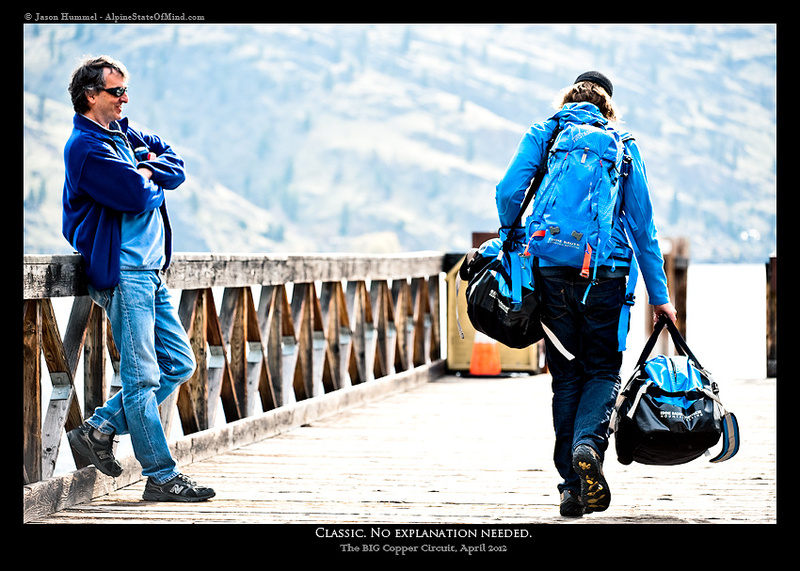 Eventually we arrived back to Holden Village and for the next day we tried to plan another adventure through Stehekin, but it wasn't to be. The weather wasn't agreeing with Kyle and me, nor our plans. So instead of being in the mountains, we spent April 16th, which was the anniversary of Kyle's father's passing, in the village. 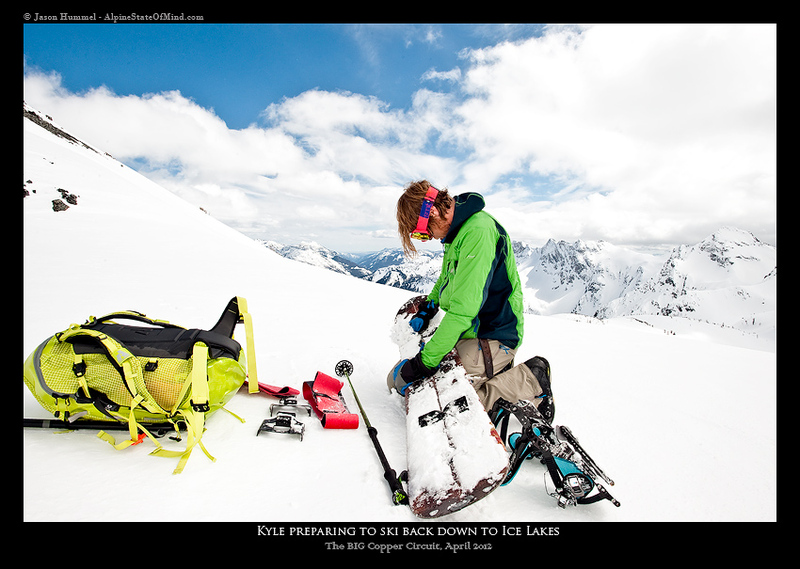 It was exactly a year in between climbs that Kyle had discovered that his father had passed away. With Brennan and his wife Tara, we spent the night taking shots of Monarch Vodka in commemoration of Kyle's father.